Why we must call it out when we see it. I was recently defriended on Facebook by a person I really like. The problem was that she had become seduced by fear mongering and I, and others, were challenging her on it and calling her out on it. Mostly because it’s really so unlike her to engage in the promotion of such fear. Her latest was the fear that a Muslim will become president. Why is this fear mongering? Because, at the moment, there is no Muslim running for president. It’s a non-issue. We aren’t in “danger” of having a Muslim president for at least 5 more years. Probably longer though given that there are so few Muslims holding political office at the moment and it takes time to build up support for a presidential run. What does rational Gun Control Look Like? What would sane gun laws look like? With the massacre of the month behind us, I’ve decided to think of what I think would be an ideal set of gun laws. I felt this was necessary because I find myself advocating for what I think is possible to enact and that’s not anywhere close to what I would ideally like to see happen. First, let me be clear. I don’t have a problem with most gun owners. I am concerned about people who feel like they need to have an arsenal. It’s not the arsenal that concerns me – it’s the reasons why they feel like they need to have an arsenal that concerns me. We know from decades of behavioral research that punishment doesn’t work. So why do we still use it as an approach to government? The purpose of the United States government, according to our Constitution, is to establish justice, insure domestic tranquility, provide for the common defense, and to secure the blessings of liberty to ourselves and our posterity. A lot of this has to do with controlling behavior, which is odd for a government whose main purpose is to secure the blessings of liberty. For instance, to secure justice, we sometimes have to secure and limit the freedom of people. The same goes for insuring domestic tranquility and providing for the common defense. The question we have to ask ourselves is how best to do all this, ideally in a way that maximizes the blessings of individual liberty? 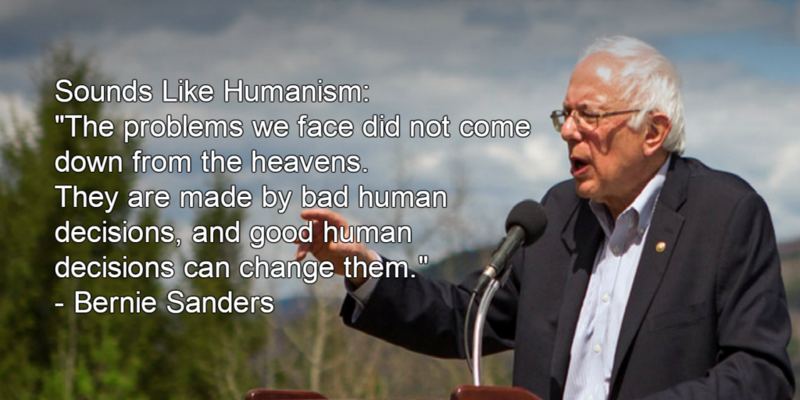 Bernie Sanders may not self identify as a Humanist, but he sure sounds and acts like one. no wonder my hubby is smitten with him. “The problems we face did not come down from the heavens. They are made, they are made by bad human decisions, and good human decisions can change them.” – Bernie Sanders. What do we want our police to do? Keep us safe of course. But they don’t always do that. Sometimes the police are the problem. So what kind of person do we want policing us? Ideally, someone who is fair, responsible compassionate and courageous. We want them to help us, which requires compassion. We want them to be fair, so that if we are accused, they treat us with compassion even though we are a suspect. We want them to be responsible and respond promptly, fairly and professionally. And we want them to be courageous so that if they are called on to use force to defend themselves and others, they will do so. Economic policy should not be judged solely on whether the system creates wealth, but rather, on whether it creates human wellbeing. Economics is the study of how resources are used, shared, traded and consumed. Resources can be human labor, minerals, produced or manufactured goods etc. When we consider human economies, we are studying how humans interact with one another and collaborate to survive. In modern economies, we use a barter system based on money where we barter our time for money and then barter the money for the necessities of survival. What economics isn’t is a study about how money or capital is made in isolation. Economics isn’t about wealth, it’s about distribution of resources and how our societies create, source and distribute things that people need, again, to survive. How critical are you of the news? What is it like raising a gifted kid?